Drill first, safety later ? Vendredi 20 janvier 2012, par Tineke Aarts // 889. Recherche des gaz de schistes.. actualités..risques...dégâts..
On 18 January 2011, The Oklahoma Geological Survey (OGS) received a telephone call from a resident of Garvin Country, Oklahoma, living south of Elmore City, who said that during that night he had experienced numerous earthquakes. This same resident had pointed out that hydraulic fracturing was happening nearby. An investigation showed that there had been nearly 50 quakes at that time. Following an analysis of the date, 43 of these were sufficiently significant to be pinpointed. The report opens with : “Examination of Possibly Induced Seismicity from Hydraulic Fracturing in the Eola Field, Garvin County, Oklahoma”, Oklahoma Geological Survey, August 2011. Its conclusion : The strong correlation between the times and the locations of these earthquakes together with physical modelling suggests that these earthquakes could have been caused by the hydraulic fracturing. New facts come to light daily. An example in the news : On November 5, an earthquake of magnitude 5.6 on the Richter scale rocked Oklahoma. The inhabitants of this vast state are used to earthquakes but this one was the strongest ever experienced in the region. Moreover, the Oklahoma residents are now learning how dramatic the increase in seismic activity there has been. From 1971 to 2008, between two and six earthquakes were experienced each year ; often too weak to be felt. In 2009 however, nearly 50 earthquakes were registered. In 2010 this number more than doubled to 103 which were strong enough to be felt, plus several hundreds of lesser quakes. The increasing occurance of earthquakes : coincidence or not ? After decades of activity by the oil companies, the state of Oklahoma has 150,000 wells, many abandoned and 181 relatively new wells where the controversial new technique of horizontal hydraulic fracturing is employed. Following the powerful earthquake, seismologists are saying in the press that the underground areas containing shale gas and oil are often susceptible to earthquakes which will occur by definition in an irregular manner. They admit that hydraulic fracturing may cause minor earthquakes, but not of such magnitude. However this exceptional earthquake has drawn public attention to the recent increase in seismic activity in the area. A striking feature is that it was not the authorities who noted this worrying development but a local resident living close to a hydraulic drilling site. The United States military and the United States Geological Survey subsequently investigated the situation and concluded that large amounts of liquid, injected under high pressure into the deep rock formations, could seep into the cracks and cause the earthquakes. The population of Oklahoma only needs to look at the timing of these earthquakes and the hydraulic drilling activities to note the link between the two for themselves. Subsequent to the resultant controversy, it has been discovered that Canadian specialists have always known that these earthquakes would happen – something that had not of course been transmitted to the general population. Over a period of ten years the incidence of minor earthquakes in Alberta has increased from 60 to more than 200 as a result of hydraulic drilling. It has even led to an new expression to describe the events : a swarm of mini-earthquakes. The number has now however begun to embarrass the Canadian authorities, once again accused of being slow to react. According to recent US studies, this increase in earthquake occurrence is happening all over the world, including in Europe. In Lancashire, England, close to the town of Blackpool, there were two earthquakes in 2011, 1 April and May 27, with a magnitude of 2.3 and 1.5 on the Richter scale respectively. The epicentre was within a few hundred meters of the exploratory drilling site of the Cuadrilla Company. Following a preliminary study by the BSG British Geological Survey, the Minister for the Environment in Britain confirmed a direct link between the two drillings and the two earthquakes in the immediate vicinity. At the beginning of November, Cuadrilla acknowledged that the drilling had been responsible ; a recent study ‘Geomechanical Study of Bowland Shale Seismicity’ attempted to explain how these earthquakes could have happened. Apparently it was a ‘worst case’ scenario and the geological circumstances were exceptional. However if two drillings have already caused two earthquakes in one trial exploration, how many would 200 drillings cause ? They would have us think that minor earthquakes cause minor damage. However following the first earthquake, the exploratory drilling at Blackpool at the time was vertical At its deepest point, some 3 km below ground, 50 meters of drilling pipe was contorted into an oval shape. As a result, it was no longer possible to insert the cap required to close off the section. Directed by Mark Miller, the well-known boss of Cuadrilla, who had claimed only two months previously in the Dutch press to be using better techniques than those used in the United States(! ), the engineers decided to resolve the problem by inserting the cap higher up in the pipe, and to continue the fracturing - an operation which caused the second earthquake. The two studies do not reveal whether this second earthquake caused additional damage, nor what was the effect of the preliminary distortion at depth. The concerns persist. Following these earthquakes there are currently moratoria in place in England and the Netherlands. Both these countries have demanded additional studies in order to be able to guarantee the safety of the inhabitants.. Meanwhile, the engineers of Cuadrilla continue to approach landowners in England with a view to feasibility studies, as if nothing had happened. What additional risks do these earthquakes add to the already known risks of drinking water contamination by the dozens of chemical products injected at high pressure in great quantities ? Let us look at what the specialists are saying in America where already there is a long list of incidents. Many studies are currently in progress, including that of the E.P.A. (U.S. Environmental Protection Agency), to be reported in 2012. In the November 2011 edition of the American Scientist, Chris Mooney explained that a battalion of lawyers are engaged in monitoring how events are reported in order to prevent the companies being implicated. However, when one looks at the totality of the operation ((hydraulic drilling, waste water storage) it is established that there has been contamination of drinking water. He then identifies three risk factors which could give rise to the contamination of underground water. The first is the concrete which surrounds the vertical pipe which may crack. The second is the fracturisation process itself which can cause new fissures in the rock which connect with the natural fissures in the rock or with the fissures caused by earlier activities. The third risk is that the tanks used for storage of the waste water may leak or overflow. In September, such an overflow poisoned a river in Pennsylvania. Contamination of drinking water of this nature can be easily detected by relatively simple tests, such as adding chemical detecting products to the wells. It can then be seen if these injected chemicals appear subsequently in the drinking water. Of course, the oil companies are not in favour of such testing as if there were to be accidents, the amount of damages they would have to pay would be astronomical. The earthquakes only serve to aggravate the risks referred to by Mooney. The editor of American Scientist is concerned that the regulators are not waiting for improved methods to address the basic safety issues. On the contrary, they are in the process of giving permission for hydraulic drillings on an even larger scale including in New York and New Jersey. The writer notes that public opinion in the US is turning against ‘fracking’. On the 18 November, this opposition manifested itself. The Delaware River Basin Commission has cancelled future projects. In Europe, the member states are independently responsible for the Shale Gas projects. As a result, there are considerable differences between the countries, some of which are often ill-prepared to handle projects so complicated and hotly contested by the environmentalists and inhabitants of the areas concerned. Opponents such as José Bové and Michèle Rivasi, battle tirelessly. Along with their battling colleagues, they have demanded a European moratorium. Commissioner Gunther Oettinger replied in July that such a moratorium would be inappropriate given that it was simply a case of exploratory drilling to see if production was economically viable. Such remarks seek to sooth the general populace. Mark Miller ,his company Cuadrilla very much in the public eye, has been quick to claim that billions of cubic feet of gas has been found in Lancashire and cites equally impressive amounts elsewhere in other European countries. But what value are these figures if this shale gas cannot be extracted in a safe manner ? Hydraulic fracturing cannot be done without risks. Furthermore, the distinction between exploratory drilling and operational drilling claimed by Gunther Oettinger is debatable. The argument does not convince the opponents nor residents who say : best not to allow it to start. The judges of the administrative council of Bois-le-Duc agree, and refute any distinction between exploration and operation. The municipality was unable to grant Cuadrilla a licence for exploratory drilling because if shale gas were to be found, the over-riding goal would be to extract the gas. As a result, the operation would exceed five years which would mean stricter controls such as environmental impact assessments. 27 October 2011, in front of the Dutch Parliament building in The Hague. Banners in French to thank the French activists who had helped to obtain a moratorium in the Netherlands through their powerful mobilisation. This case law must have discouraged the Queensland Gas Company. 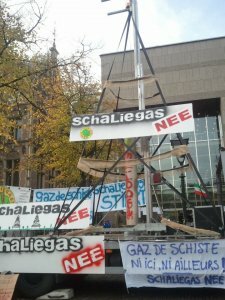 The Dutch government has just been informed that it will be not be taking up its concession to explore for shale gas in the east of the country. The reasons for this are not known. Will they be going elsewhere in Europe where the process is easier and the opposition less ? The more democratic the country and the more the inhabitants are listened to, the more the oil companies seem to be fairing badly. The ExxonMobil Company has admitted in the German press that the oil industry must improve communication with the population if it wishes to have any chance of continuing to operate in certain countries. This same company however is not willing to speak to the press on the subject of benzene and mercury found in drinking water following a broken pipe in one of their work sites in Lower Saxony. Empty words. Poland seems to be the only country to welcome the oil industry with open arms. The Ministry of the Environment (sic !) has agreed some 100 concessions which cover 37,000 square kilometres of the country giving it the honour of becoming the “Gasland of Europe”. The operation was sold to the population by the argument that the profits would be subject to a specific tax and the resultant revenue channelled into a special pensions fund. The exploratory drillings then began without any local consultation. Even the municipalities were not informed of the work sites and can do nothing for the inhabitants living sometimes within 150 meters of the wells. What safeguards have been put in place ? What safety guarantees are offered by the Polish government ? Little is known about what is happening in Europe. One news story that has emerged : on 11 October 2011, an earthquake of magnitude 4.1 occurred in Bulgaria, measured depth 10 km. The epicentre was 11.4 km from Rogozin where there is a hydraulic well in operation run by the company Rusgeokom. The Bulgarians are actively opposing the operation and are demanding a moratorium. Following the wave of privatisation, the European Union and the Member countries have little power over the oil companies which are taking full advantage of the current situation. The European Committee on the Environment, Public Health and Food Safety has published a report that reveals many loopholes in the legislation concerning shale gas. These loopholes and the variations between the various countries give them carte blanche. If the protests had not been so significant, they would by now be much closer to achieving their ambitions. No doubt the impacts of the earthquakes will give rise to new debate about shale gas at both local and global levels, but is this enough ? There are scandals in the offing. The way in which dangerous chemical products are being used in hydraulic fracturing is probably illegal according to the REACH directive which regulates the use of chemical products. But so what ? Sanctions will not bring this powerful industry to its knees. Its players will continue to use their lobbies and even blackmail, since it is they who set the prices at the pumps. Too bad for the people, animals and plants whose habitat is damaged for ever by the hydraulic drilling with all its known risks. Too bad for the future generations. The United States did not want to sign up to the Kyoto commitments in the first place ; Europe does not seem to have the power nor the will to enforce them seriously. Unfortunately, this Shale Gas will have to make the earth quake on a much greater scale before any real steps are taken towards renewable and safe sources of energy - the only option which offers a sense of perspective to today’s youth.